Last week, I promised more stone fruit, and here they are! Apricots! 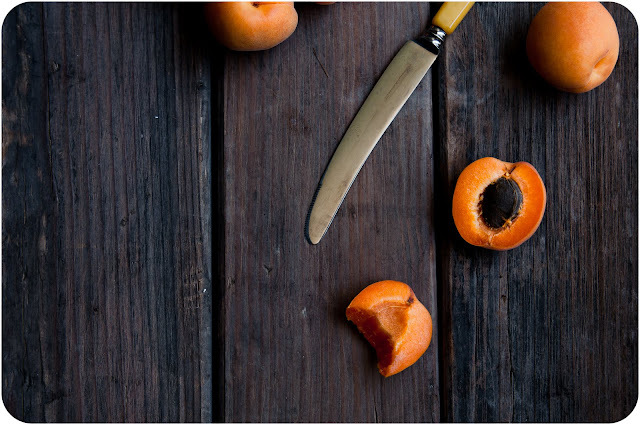 Apricots always remind me of my grandparents because when my grandpa and grandma would tend the wonderful apricot tree in our backyard, it would bear the most amazing fruit in the largest quantities you've ever seen for us. We'd have more apricots that we could ever imagine what to do with, and my mom would futilely try to stuff the ones that we couldn't eat into our already over-packed freezer. (Yeah, apricots never taste quite as good after they've been frozen.) Too bad that I didn't bake back then or else I would have made this: apricot pistachio chocolate mousse tartlets. There's something about the chillier nights that we've been having lately that really had me craving a dessert more substantial than a simple apricot tart (though there is absolutely nothing wrong with a simple apricot + pastry tart!). I wanted something darker and more robust (I think this goes along with me being a very mood-oriented baker)--hence, enter the dark chocolate mousse and the layer of velvety dark chocolate painted on the bottom of each pistachio tart shell. Years ago when I first started learning about cooking and watching the Food Network religiously, I, for some reason, came to think of mousse as this ridiculously difficult dessert to make and avoided it because of that, but in actuality, as I discovered a few years later, it's super simple, especially with chocolate mousse! The mousse filling for this tart is adapted from a chocolate mousse recipe out of my chocolate bible , and the hardest part is just folding the cooled chocolate custard into the whipped cream--but even that is hard to screw up, I promise. Then, the chocolate does all of the setting work in the fridge with no fuss required. The tartlet crusts here are flavored with a hint of ground pistachio, just enough to give the crust a bite of nuttiness and earthiness. They turn out with the faintest trace of green if you squint your eyes and look really closely for it, but I love that they aren't the bright, in-your-face-food-dyed-unnatural green pistachio you sometimes see. Then, the rich creaminess and smoothness of the dark chocolate mousse is perfectly off-set by the almost-crispy, fresh, and mildly sweet apricot slices on top--I try to pile and stack as many of them as tightly as I can on top, because I like to have as much fruit as possible. Finally, a sprinkling of roughly chopped and toasted pistachios hint at the flavor in the tart crust, amidst all of that fruit and dark chocolate. My serving suggestion for this tart would be to pair it with a nice, light dinner, as summery as you could possibly go (I opted for Vietnamese spring rolls), because this tart is so rich and hearty that you'll want to save most of your stomach for it--and a dark, straight-up black tea to go along. Chocolate mousse recipe adapted from Robert Steinberg and John Scharffenberger's Essence of Chocolate . 1. In a food processor, combine the flour, pistachios, and sugar and process until the pistachios are finely ground. 2. Using the food processor or a pastry cutter, cut the cold butter into the flour and pistachio mixture until the size of small peas. 3. Add the egg yolk and gradually add the water just until a dough begins to form when you press it between two fingers. Do not overmix. 6. Remove the pastry dough from the fridge and press the dough into the tart pans. Prick the bottoms of the dough all over with a fork, cover with parchment paper, and weigh down using dry beans or pie weights. 7. Bake for 15-20 minutes until the pastry is golden brown. Remove from the oven, remove the beans, and let cool. 8. 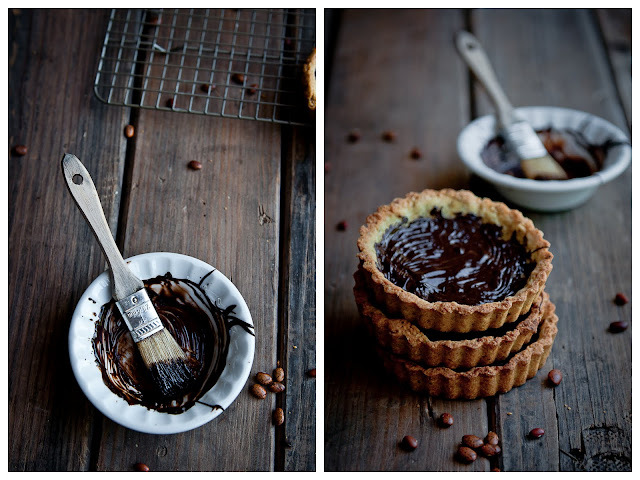 Once the pastry crusts are cool, melt the dark chocolate, if using. 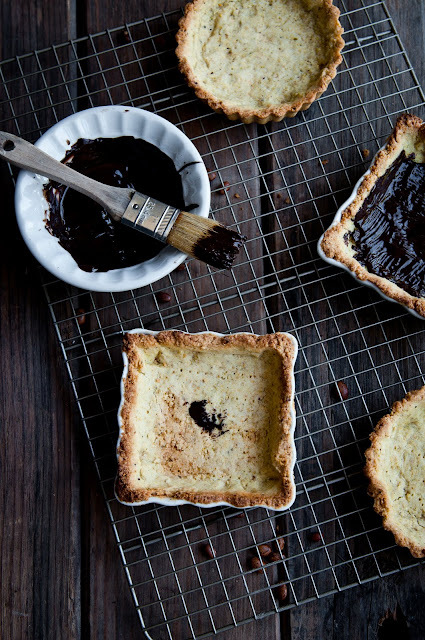 Brush melted dark chocolate on the bottoms of each of the tarts. Let cool. 1. Place chopped dark chocolate in a bowl with a fine mesh sieve on top and set aside. 2. In a small bowl, whisk together the egg yolks. Set aside. 3. In a saucepan on medium high heat, bring the milk and sugar to a simmer. 4. Temper the egg yolks by pouring in a small stream of simmering milk to the egg yolks, whisking constantly. Once the yolks and milk are combined, return to the saucepan and to heat. Cook, scraping the bottom constantly with a spatula until a custard forms and is thick enough to coat the back of a spoon. Remove from heat immediately. 5. Pour the custard through the fine mesh sieve onto the chopped and prepared chocolate. Let sit for one to two minutes. Whisk the chocolate and custard together until smooth. Let cool to room temperature. 6. Meanwhile, chill a large balloon whisk and bowl. 7. Once the chocolate custard has come to room temperature, whip the cold cream in the chilled bowl until soft peaks form. 8. Gently fold the cooled chocolate custard into the whipped cream until combined. Do not overmix. 9. Cover and chill the mousse to set in the refrigerator for at least four hours before using. 1. Pipe or spoon the mousse into the prepared tart shells. 2. Slice the apricots and arrange on the chocolate mousse. 3. 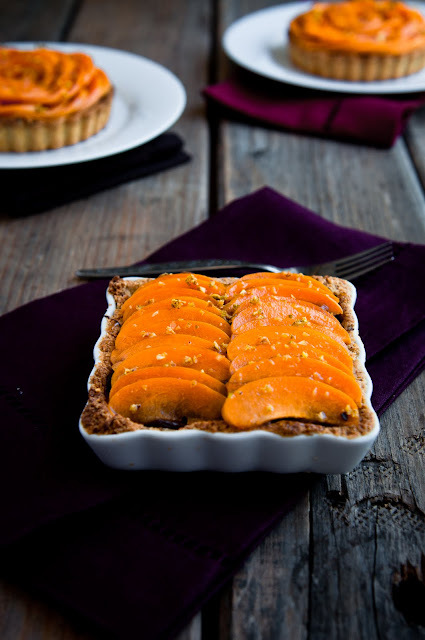 Warm the apricot jam and, using a pastry brush, lightly coat the apricot slices with warm jam. 4. Top with roughly chopped pistachios. Yum! I just made tartlets last night (though I haven't posted about them yet). I love your square tart pans - so cute! 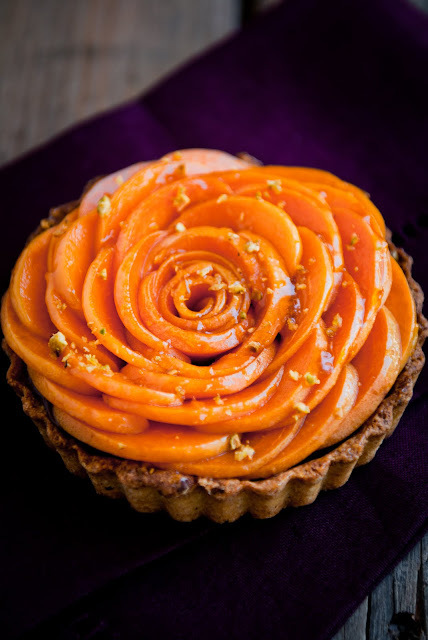 I also love the way you arranged the apricots in the round one tarts - you are so good at making your desserts look like works of art! "round tarts", not "round one tarts". Me no good talk. OMG! OMG! This is just absolutely BEAUTIFUL!!!!!!!!!!!!!!!!!!!!! Yum yum yum. I love chocolate in fruit tarts. I also love the second to last photo (more than I adore all your photos!). So so pretty. You amaze me. Such delicious looking tartlets and your photos are stunning. Great job, as always, Steph! I really can have this tart for breakfast everyday!!! Love your pictures..
Those are beautiful Steph, especially the flower one at the end, but you need to get your hands on some real Iranian or Sicilian pistachios to see the gorgeous natural green color. I wouldn't mind eating any extras, I don't think I've ever had apricot, pistachio and chocolate together, always just apricot and pistachio. Gorgeous! I've never used apricots with chocolate before but this looks divine. Happy to have found you. [sigh] may I come around to visit please? They look fab! I am so glad I stumbled upon this on TasteSpotting! This is absolutely stunning, a combination of some of my favorite flavors. Beautifully done, I look forward to trying it! Oh, these tartlets are too beautiful to eat! I love your photographs, they make me drool! What a beautiful presentation! The color of your apricots is fantastic! not to mention it looks delicious.. I really need to go out and buy some aprictos! WOW. These pictures are stunning. As is the tart. 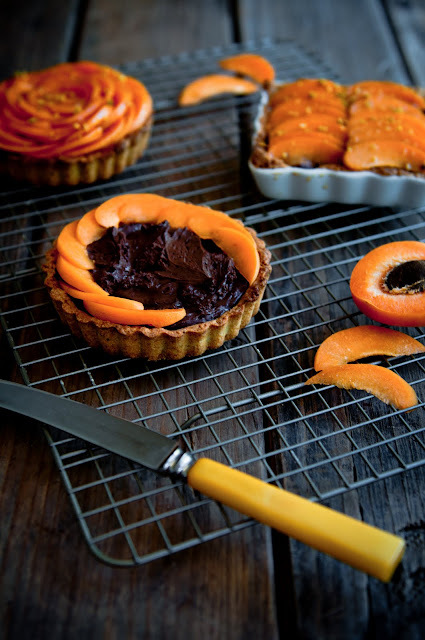 I have been very much into making tartlets lately, and the combination of chocolate and apricots I may need to try. You have a new follower! these are lovely! 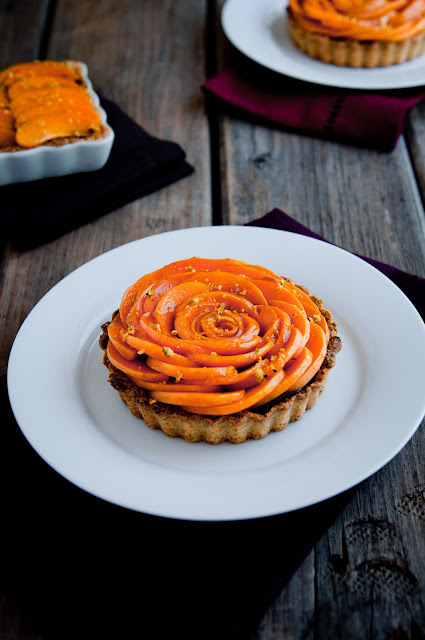 I love how you styled the tarts - they look like flowers! Speechless! 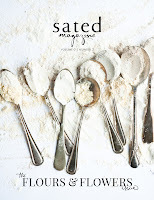 Such beauty- your photography, styling and recipes are so inspiring!!! I absolutely love this. You are a beautiful photographer. Stop by my blog if you get a chance! Oh yes, yes, yes. Can I have one now? Right now please? GORGEOUS colours. These look divine; come to my place and concoct these for me! oh, thank you so much again everyone! @Carolyn Jung: lol--that's very true--I could have done without dinner! Those tarts look so amazingly good! I really like the flower like design with the sliced apricot. These are gorgeous! I love the dramatic contrast between the dark chocolate and bright orange apricots. Hi! Thanks for sharing this recipe, I made this and it turned out great! P.S. 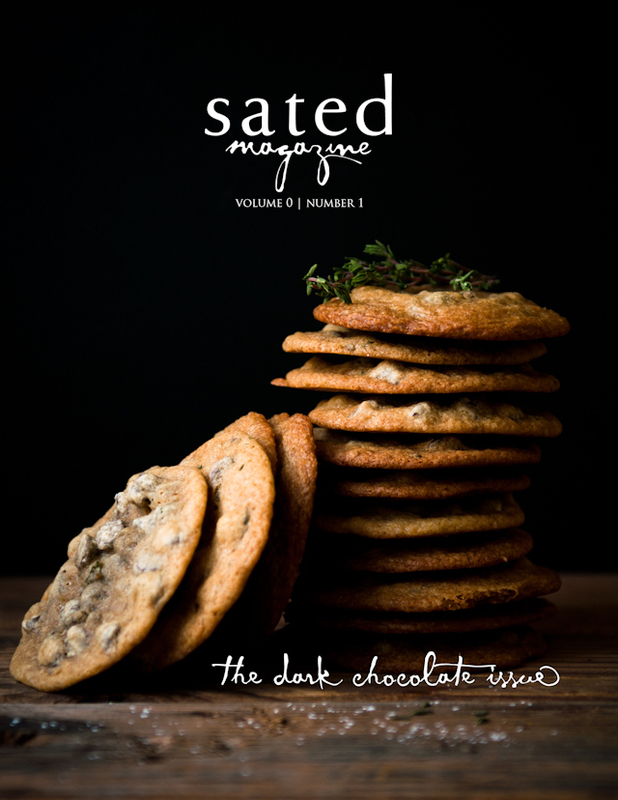 Didn't have time to write earlier - I love your blog and literally read every post....so captured by your photography and descriptions and the unique combinations of ingredients. Although I was a bit intimidated by it all I really wanted to try make something so finally I took the leap and attempted this - my first ever tart! Made a couple of rookie mistakes but overall it still looked good and tasted delicious!